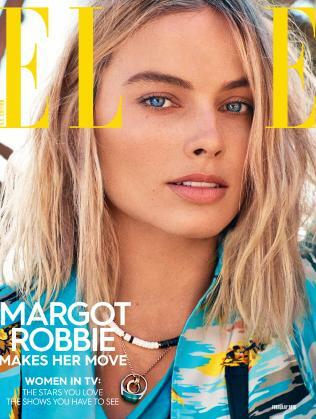 AUSSIE actress Margot Robbie, who is set to appear in the upcoming biopic I, Tonya, has revealed she has her sights on a new career in the latest issue of US Elle magazine. The Suicide Squad star graces the cover of the magazine's February 2018 issue and inside reveals her big plans for the future. In the interview with Elle, Robbie talks about the challenges of taking on the role of American figure skater Tonya Harding, saying that playing a real character "who's very much alive and is widely documented, can be more intimidating". Robbie's portrayal of the controversial figure has received widespread acclaim, however, with the actress already receiving a number of nominations this awards season, including the Golden Globes, Baftas and AACTAs (which she won). The actress told the magazine that her ambitions go beyond her acting career, with her sights set on becoming a director. "I still love acting," she said. "But I've spent the last 10 years on a film set, and I realised that if I am pouring my heart and soul into a film, I want to be one of those voices in the conversation making decisions." She also spoke about her first career highlight, revealing that when she arrived in New York for the first time, she spent her first paycheck at Tiffany's: "[I] walked straight into Tiffany's on Fifth Avenue, and bought an airplane charm that goes on my bracelet. It was the best feeling ever. I got my little blue box, and I got it for myself." The 27-year-old, who has made waves in Hollywood since appearing in The Wolf of Wall Street with Leonardo DiCaprio in 2013, said she is still adding to her skill set. "I recently bought fire-twirling poles, because I really want to get good at it. When I was backpacking in the Philippines, there were heaps of fire twirlers on the beach, and it was so cool. I was like, Wow, I really want to do that!" The magazine goes on sale in the US on January 16. Is Lilly the next Margot Robbie?